We congratulate our new soldiers in Christ: 65 boys and girls received the Sacrament of Confirmation last Tuesday, along with the Rosary remembrance that Council 6855 provided each one to arm them with prayers for the spiritual battles ahead. Congratulations, too, to Bro. Francis Lee for 10 years of volunteer service with the Canadian Blood Service. He was honoured with a plaque and acclaimed for his outstanding volunteer contribution to the community at the Annual Honouring Our Lifeblood awards ceremony last April 28. Our daily Rosary was off to a great start this May 1st, which also happened to be the First Friday (Sacred Heart of Jesus) and the Feast of St. Joseph the Worker. So we had the whole Holy Family along with 20 or so Knights and other parishioners gathered that beautiful evening. Join us whenever you can. Our Blessed Mother will be pleased. 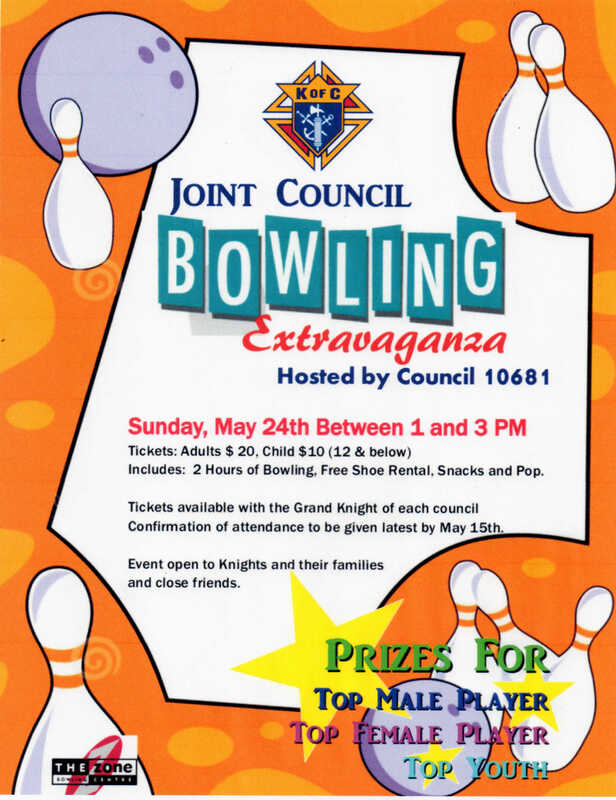 The Joint Council Family Bowling tournament is pushing through on May 24 Sunday afternoon. This is great family bonding time regardless of whether you know how to bowl or not. Here is the link to the poster. I need to send in the names by May 15 so please let me know if you can come and how many you are brining. On a more solemn note: we bade goodbye to Bro. Jackson Valenzuela, who joined our Creator yesterday. Please extend your condolences to his family. We are taking up a collection to help them out – whatever each one of us can spare adds up to much when we all participate. This gesture rings true to our founder’s original mandate of taking care of the widow and orphans in our community. Our Sis. Lyce Rozario’s scheduled knee replacement surgery has been moved up to May, so we will be cancelling the Dancercise classes this May, to be resumed in September when we hope she will ready to bounce back onto her twinkletoes. Please keep her in your prayers. So far, we have a couple more seats available in my van for March for Life on May 14. Let me know if you can join us.